Thank you, Linda! Actually you have been “pinned” four times now. I like to let people know when I pin their site so they can say if it’s okay or not. After all, your blog is your creative property and you have a right to determine how it is used! Further, your blog stats may not reflect the true power of your site when images may be being viewed by 30 pinterest viewers who have not clicked through to your site, but now know who you are! A similar service out there that is not image dependant is Stumble Upon. I belong to both services. And when I find a blog I like I hit the “I like it!” button and if no one has ever donet that before the blog gets added to the Stumble Upon search list according to the category I assign the blog to. For novice bloggers out there, this is another reason why tagging your photos and giving them good descriptions and captions is SO important. A Pinterest tag cannot occur if you do not have photos. And your photos might not be found if they do not have keywords associated with them. Give your photo title one ripe with key words and give the alt title other good key words to ensure you get noticed by search engines! (An aside: Another pet peeve of mine is when bloggers or web site writers create a link that opens on the page you’re on. To ensure your readers don’t stray from your page, have your links open in a blank page. That way when they close the link window, they are still on the wonderful, incredible resourceful site that is YOURS!) For more tips on blogging (especially for wordpress sites) check out Time Thief at her blog One Cool Site. She is the absolute best. Her tutorials on using HTML tables to present your photos in a neat fashion are excellant and you can copy her code to create your own template even if you know nothing about HTML or any other computerese. As far as my header, thank you so much. This image snippet was from the first needlepoint project I completed as an adult, the second of my life. Actually my first project was petit point and I never wanted to do it again. My EGA friends pointed out most needlepoint is not quite as challenging and is easier on the eyes. The petit point I did as a teenager. The header pattern can be found (free of charge) under the American Needlepoint Guild’s Education section. It is called “Honey, I Shrunk the Heart.” Check out this pattern and the other wonderful info to be found in the Stitch of the Month resource! In my reply to your comment, I will link back to your blog or website. Some people don’t know that by clicking on your name they can contact you or your site. If I put a link in my reply it makes it easier for others to find you. I don’t have room on my blog to list all the wonderful sites I visit. Where I can, I will add your site to Stumble Upon or Pinterest (and let you know that I have done so.) If this is not acceptable, please use the contact form found under the TSS Mission Button at the page top to contact me privately, or tell me not to link back in your comment! I appreciate all the kindness I have found in this community! Please be kind to my commentors and check out the links in my replies to their comments! TAST2012 Week Four: Laissez les bontemps roulez! That’s French for let the good times roll, if you didn’t know. And that was my theme for this week’s stitch challenge. But back to my Cretan stitch sample. As I said in an earlier post, I’m letting the passing year’s events dictate color and how I will use the stitches in the challenge. Right now I am in Mississippi, about 30 minutes from New Orleans. Carnival has began on Twelfth Night or the Feast of the Epiphany. It will end at the close of the Tuesday before Lent, called Fat Tuesday or “Mardi Gras.” It is important to know this is not a New Orleans thing, but a cultural thing tied into the Catholic and other Christian calendars, linked back to when the French ruled this part of the US. Truth be told it goes back way beyond that, too! There are three colors associated with Mardi Gras: Gold (or yellow), Purple, and Green. The gold stands for wealth, purple stands for justice, and green stands for health. The fleur de lis is a popular symbol which basically represents a lily. So, I used these colors to create a Mardi Gras or Carnival band on my TAST sampler. I used an layered and stacked cretan stitch in DMC cotton #552 and #561 for the cretan stitches. I filled the center area with a row of double knot stitches (aka Palestrina stitch) in The Gentle Art overdyed cotton # 0580 (Orange Marmalade, my favorite orange/yellow). I used the purple DMC to make mini fleurs des lis on the top of the banner with a lazy daisy stitch (aka detached chain) and straight stitches. Then I used amethyst, green, and gold 11° seed beads on the bottom of the banner to give the effect of swag. So, what do you think? Do you want this graphed out for you? You have but to ask! Whew! Didn’t think I was going to catch up on the Challenge. This week the challenge was the feather stitch, another member of the buttonhole stitch family. I think it is one of my favorites. It’s great to use to make seaweed, or branches and twigs, or vines of all sorts. (Please, please check out these links–the artistry is incredible! The first is a Sharon Boggins project and the other two are Week 3 participants The Smallest Forest and CrazyQstitcher.) It would also make cool ripples in the water or in clouds. I used it to make–of all things–feathers! I also decided that since this is a sampler, there’s no reason I can’t put some “verse” in it. Instead of the traditional Proverbs or Psalms that little girls of old would be trying to learn, I decided to add some reminders of Buddhist ideas that I want to keep front and center in my brain. Truth be told, stitching is a kind of moving meditation for me. For some reason unknown to me, I immediately thought of angel wings when I thought of feather stitch. (Maybe it’s because my thoughts fly all over the place when I meditate!) So I googled “images of wings” and got lots of ideas for how to proceed. At first I thought I would put a pair of wings on either edge of the bottom of my year banner. After I got started, I decided that–like most things I plan–I had bitten off a bit more than I could chew. I used two threads for the wing: YLI Ribbon Floss Shimmer Blend #101 Icicle Super and Weeks Dye Works Overdyed Cotton #1086 Icicle. I was going to use Weeks Snowflake, my favorite white thread of all time, but the bluish cast of the Icicle worked better with the YLI. (Another color way I thought about using was using the Snowflake with Rainbow Gallery’s Treasure Ribbon PR10–those two have a more pinkish cast to them.) 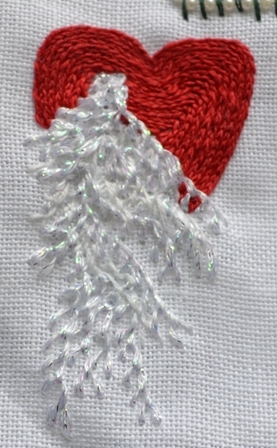 I used Anchor cotton floss #13 for the heart and filled it in with a stem stitch. The text was something I threw in to help me remember something I’ve read three times and keep forgetting. I thought if I stitched it, it would stick in my head a little better. In Zen Buddhism, students may use Koan’s to help understand their lessons and enhance their Path. 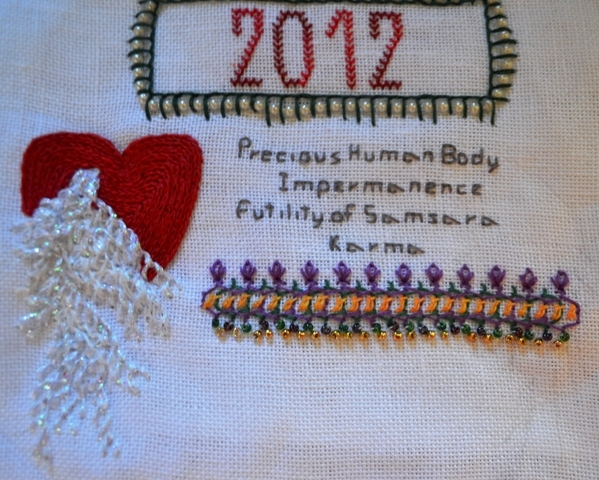 In Tibetan Buddhism, slogans are sometimes used in Lojong practice, phrases to help one train the mind and open the heart (see the embroidery connection!) and thus live Buddhist ideals on a daily basis. The first slogan is “First, learn train in the preliminaries.” I kept forgeting what the distinction between the four preliminaries were. Now I know! I mentioned before that I’m participating in Sharon Boggon’s Take a Stitch Tuesday 2012 challenge. For those unfamiliar with what this is about, every Tuesday Sharon shares an embroidery stitch with the group. She gives detailed instructions on how to complete the stitch for those unfamiliar with whatever the stitch of the week is. 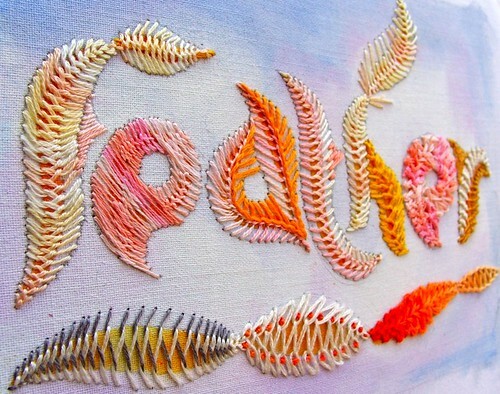 For those who have some experience with the stitch, she provides inspiration and a challenge to play with the stitch and see if you can use it in a different or creative way. She gives photo examples of how she has used the stitch, often in one of her crazy quilt blocks or from one of er own stitch samplers. We are now at the end of week two. I struggled to get started as I needed to decide how I wanted to proceed with the stitches. You could just work up a doodle on your collar. Or you could stitch/paint a landscape. Or you could do a crazy quilt block. Or you could do a traditional sampler. Or you could do a sampler like Sharon’s Sampler of all Samplers! I decided to do a more traditional sampler. We’ll see what happens over time. I used the buttonhole stitch from the Week 2 challenge to couch some pearl trim into a square to place my start date. 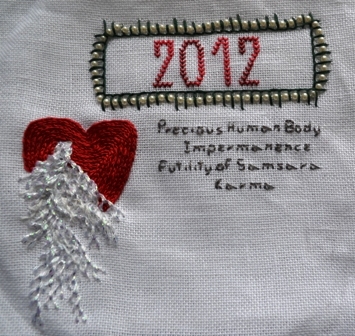 I used the Week 1 challenge fly stitch to write out “2012.” I’m using a 28 count linen for the ground. The buttonhole was worked with Weeks Dye Works #1278, Holly. The fly stitch was also Weeks overdyed cotton, but # 2266, Turkish Red. I thought since I’m starting this in the winter, I’d use wintery colors and let the colors in future stitches reflect the passing of the year. What do you think? I kind of like it! Maybe Mary isn’t the only one wondering about the hardware used to make the blackwork purse in my last post. The directions that came with my chart say you can get the hardware from Lacis (#LS75) for shops. It is a 3 inch heavy frame. If you can’t find it in a shop then you can call Wyndham (1.860.974.1214). Maybe they could direct you to a finisher if your local shop cannot help. 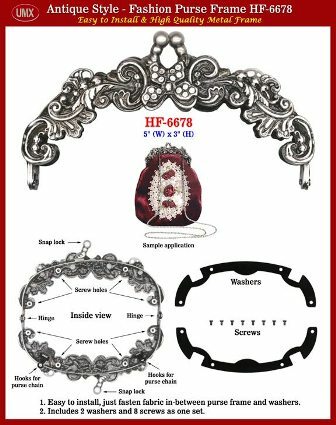 On the other hand here is a link for some pretty cool handbag frames: UMX Fashion Supplies: Purse Frame. This image shows how easy it is to assemble. (click on photo for larger image) However these frames are more than 3 inches, so your worked piece should have enough extra fabric to accommodate the 4 or 5 inch frame. I suspect you could find people in your local needlework or quilting chapter who might be able to help you. If this doesn’t help, contact me and I’ll see if I can get my partner to help out. He is a leather worker and engineer and takes care of my more challenging assembly problems. You can use the contact form found in the TSS Mission section of the heading tabs. Behind those doors are hours of needleworker Nirvana! 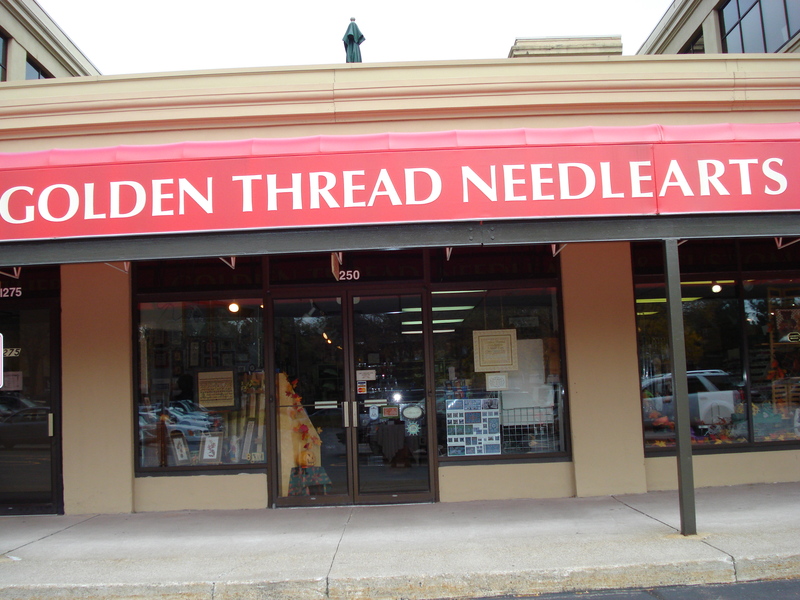 When I first joined the Rochester Chapter of the Embroiders’ Guild of America, I learned about this shop. It is staple for EGA and American Needlepoint Guild members of the area, as well as the solitary stitcher. I can honestly say all stitching needs are met here! There is an abundant sampling of countless thread types suitable for needlepoint, crewel, any form of embroidery or surface arts. There are a number of walls loaded with instruction books for all these art forms as well as a special rack for the newest and/or most popular texts. Tools and buttons and frames and trunk shows and samples of completed works fill all remaining space including the glass showcase counter in the center of the store. There is a separate fabric cutting area and a corner in the very back devoted to framing needs for your treasures. And that’s just the “stuff”. Whenever I have a question the very busy staff answer it completely and in turn. (I think this is important, some shops tend to give all their attention to the frequent and familiar shopper or let familiar people interupt. Those sorts of shops will not find their names on this blog!) When I have seen a finished piece somewhere all I have to do is describe it and the owner (Andrea Kelly) walks right to where that obscure little packet is filed. Case in point. I saw a set of blackwork “Alice Through the Looking Glass” pieces framed in another shop. That shop did not have the patterns available. (Why showcase a piece you can’t sell the pattern for?!) When I described the piece, the Andrea put a couple different patterns from the line in my hand. I walked out with what you see on the right.The needlepoint in the heading area was my first attempt at needlepoint. The Andrea helped me pick out the materials every step of the way. And did not make me feel stupid, either. You see she’s a stitcher, too. Once I walked in and she was repairing a sampler that was dated in the 1800s! She let me touch it! I get shivers just thinking about it. But that’s how good Andrea Kelly is. Tough choices must be made! On my last visit before we hit the road, after she had helped me with my purchase, I asked Andrea my questions. What color, what fiber, what stitch? No one so far has had as much trouble as she did! I felt like I was asking her to name her favorite child. Sacrilegious! In fact, she really balked at doing this. Finally, though, Andrea revealed that that she liked vibrant earthy colors that spoke of life. She named a couple fibers that had the quality that she liked. I picked out several possibilities with these descriptions in mind. This is the selection. No, Andrea absolutely could not choose just one! And there are special directions for the working!Caron’s Watercolours in #144 Pomegranate should be stitched (on 18 count mono canvas) as the flat stitch in Criss-cross Hungarian stitch and Rainbow Gallery’s Fyre Werks #FT26 for the crossed part of the Criss-cross Hungarian. Actually Neon Rays Plus was the first choice for the metallic fiber, but the colors on hand just didn’t work as well with the overdyed floss. It’s very clear why stitchers return again and again to this stitcher friendly shop. You should put it on your “To Visit” list, too! So far the majority of the colors chosen by shops are in the green range, so the resulting piece may be more abstract than representative of events and images from my travels. But that’s okay. And I happen to love green, too! The trick then will be to really work with texture and shading. Both of the Pin Tangle experiences will let me focus on these techniques to the extreme. Just a note, while the Studio Journal class (beginning in February) does cost $60 and is limited in class size–for all I know the class may already be filled–TAST or Take a Stitch Tuesday is open to the public and free of charge. Click on the links for either of these events for additional info! See you on Saturday. If you’re going to do either of Sharon‘s lessons, leave a comment so I can link to your photos!